Scroll Down to to see the following lines: LCD Monitor TV Mounts - Flat panel VESA LCD brackets & mounts for wall, ceiling, desk, and pole applications. 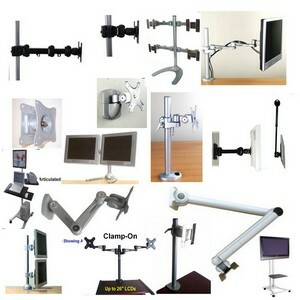 Universal pole LCD monitor mounts, LCD & Plasma TV Mounts, Pedestals & Carts; Articulating LCD mounts & arms; Flat Screen desk stands & mounts; Multiple LCD stands: Dual & Quad Flat Panel desktop stand; Rolling LCD monitor computer stand workstation. This category includes the most popular LCD monitor mounts, with VESA mounting hole patterns for LCD and TV screens. For wall, ceiling, desk, floor & pole LCD mount installs. We also include here keyboard desk, pole and wall mounts, as well as the D-IP iPad VESA adapter to mount an iPad on any of our mounts.